I love yard sales. I have so many fond memories of going "yard-sale-ing" with my mom on Saturdays as a kid. It always felt like a treasure hunt. Of course back then we had to do a lot more "hunting" since we didn't have GPS to quickly find where we needed to go or snap a photo of the yard sale sign with our smart phones instead of sitting in our car trying to find something to write the address on. 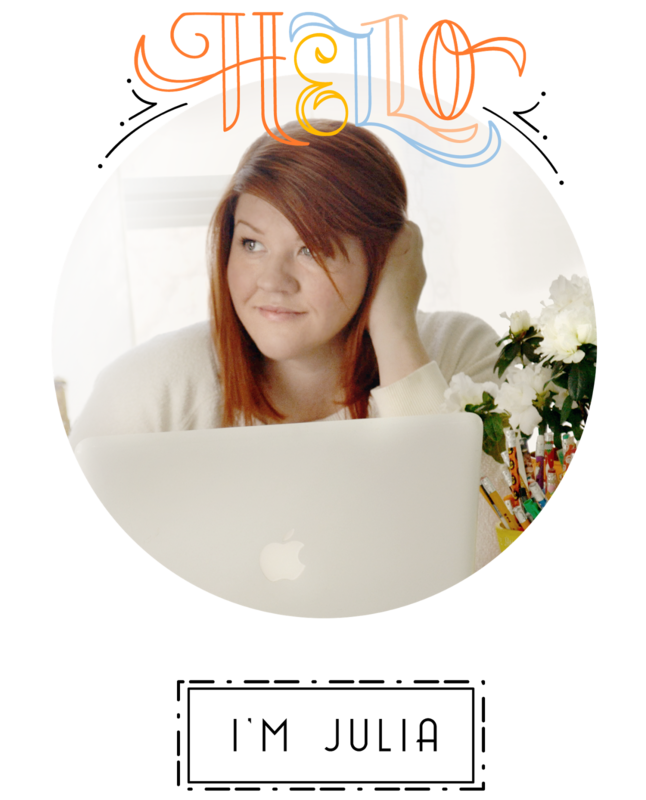 Yard sales have gotten so much easier thanks to technology. 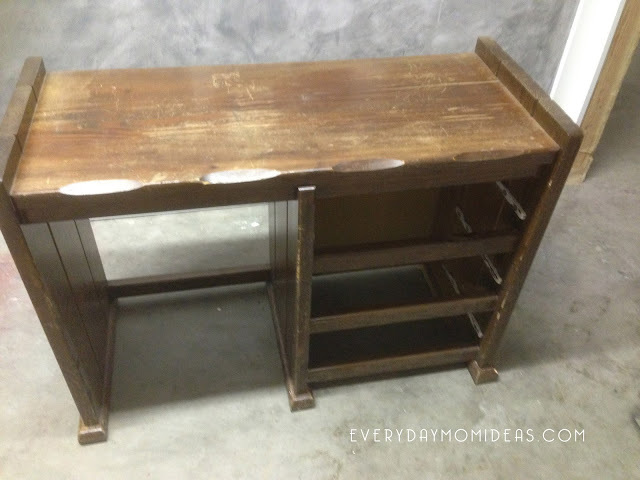 I found this solid wood desk on a local Facebook online yard sale for $20.00 and I couldn't believe it. It was just what I was looking for to use in my tween son's new room and it was in such good shape. 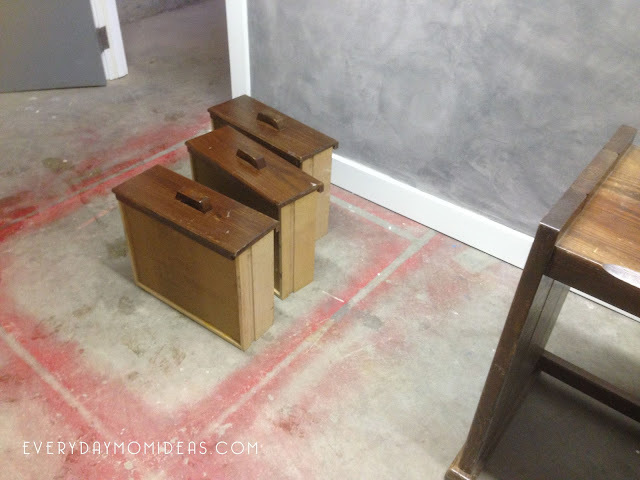 I especially love the vintage wood handles and newspaper drawer linings. I also love that this desk was solid yet small enough not to overtake the room. The Wood & White style is perfect for this makeover look because it still allows some of the beautiful solid wood to show through and gives those cute wood handles a pop. 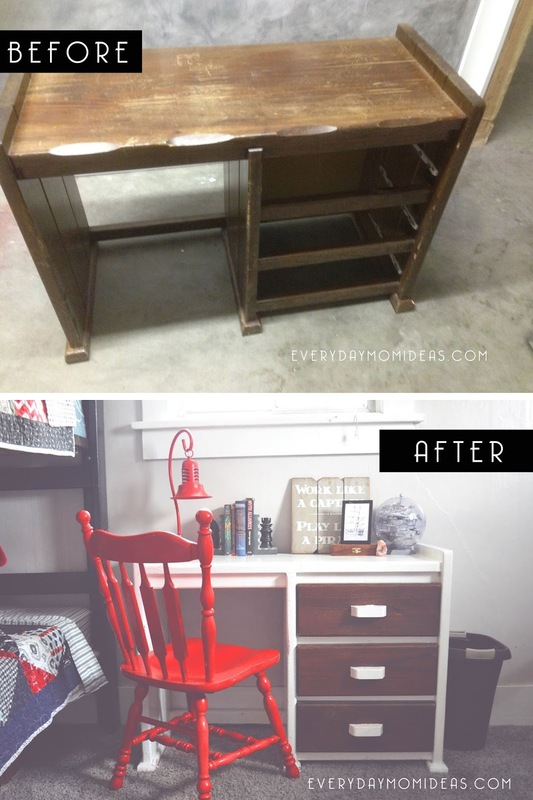 I was inspired by this White & Wood makeover piece by Cencational Girl. 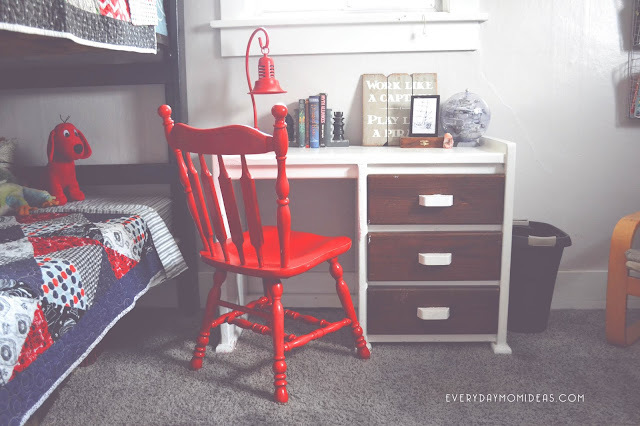 She did a beautiful job freshening up this art deco chest of drawers and I wanted to create the same fun look with the vintage desk I found. She also has some great tips for making over wood furniture and wood laminate furniture. I used a white paint and primer in one. There are plenty of product out there for stripping old varnish and wood stain but Ive always just take a little bit of sanding to it and skipped all those extra chemicals. Sanding and roughing up the surface helps the paint to adhere better to the surface. I then applied about three coats of paint/primer over the course of a few days. It was winter when I did this project and it just got to cold sometimes to stay out in the garage and literally watch paint dry. For the wood handles I taped around the handles with quality painters tape and applied three thin coats of paint/primer. Its also a good idea to apply clear wax as a protectant once your painting portion is finished. It helps to prevent yellowing of your paint job and helps protect against stuff sticking or tearing away your paint. 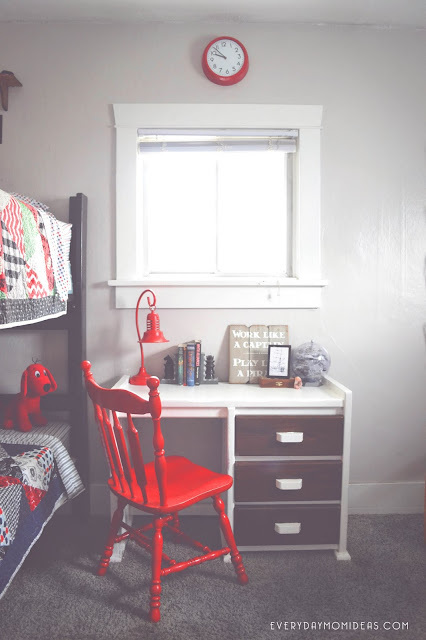 This Boys room makeover just wouldn't be complete without this charming desk. It has a lot character to it and adds a whole other level of style to the room. 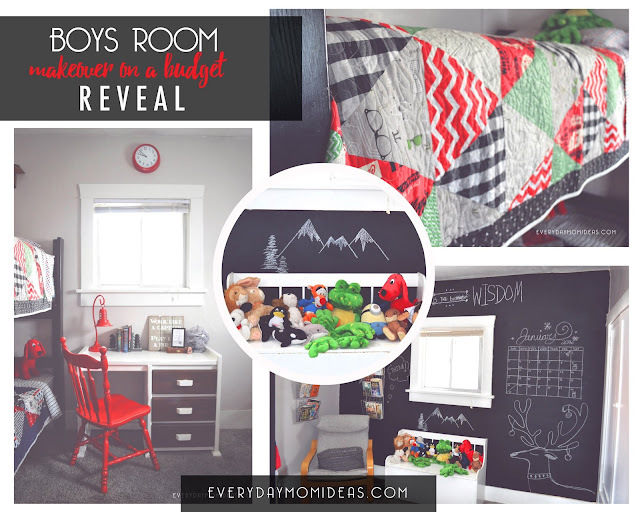 You can check out the full boys room makeover reveal here. They just don't make furniture like they used to and I find it such a waste of money to buy wood furniture brand new from the store just so it can beak within the year. These vintage finds are cheaper and studier and always a good investment. You just have to hunt a little bit, and that just adds to the fun of it anyways.